Before I even reach Eleanor Friedberger, her Dad’s heckling about Lancashire’s County Championship cricket woes. I expect sledging from Australians, but not someone from Chicago, Illinois. Turns out that he’s originally from Northamptonshire (whose own cricket form is hardly spectacular), while Eleanor’s Mum is of Greek stock, as her daughter explained. “Mum’s American, but her family’s Greek. I started going with her over 20 years ago, then about nine years ago started playing in Athens, developing a great network of friends. That eventually led to acclaimed fourth solo LP, Rebound, after eight more treasured albums alongside her brother Matthew, four years her senior, with indie favourites The Fiery Furnaces. While Eleanor, 42, was born in Oak Park, Chicago, where I found her ahead of a show at The Empty Bottle, she resides in Ulster County, New York, and is very much a citizen of the world. No borders or phoney walls for this talented performer, about to end a 17-date North American run. 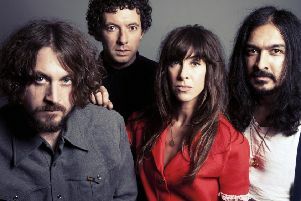 Eleanor Friedberger is playing a gig at Lancaster Library, following in the footsteps of acts including Florence and the Machine and Adele. Next up is the European leg, eight UK shows followed by five more in the Netherlands and Germany. Before her New York move, there was a spell for Eleanor – who also recently film-scored a live Andy Warhol project alongside Martin Rev (Suicide) and Tom Verlaine (Television) – in London. That was in 1999, and inspired a visit to friends in Sweden, where she first performed. Her UK dates include a Get It Loud in Libraries show in Lancaster, for a project showcasing emerging acts that has delivered more than 240 North West library shows since 2005, past acts including Adele, Florence and the Machine, Jessie J and Plan B. Has Eleanor played a public library before? The UK leg includes two Scottish dates, my excuse to mention Franz Ferdinand’s ‘Eleanor Put Your Boots On’, written in her honour by Eleanor’s ex, Alex Kapranos. Nice to have songs written about you? Before London there was Austin, studying film and American Studies at the University of Texas, ‘an amazing place to see live music’. Was she writing then? Eleanor had already started playing with a university friend when Matthew joined her. “We started by me kind of telling stories. I remember telling him one, him saying, ‘That’ll make a good song’. That was the first we wrote. He was the best musician I knew, so it made sense to ask him to join. “There was no master plan. It was more, ‘All these other people are doing this, we can do just as well’. Four solo albums have followed eight with her brother, with Rebound arguably her most commercial.